Senior right fielder Antoine Duplantis became the sixth player in LSU history and the 25th member of the SEC to record 300 hits in a career. He opened the game in his 933rd career at-bat with a single up the middle to record the career hit, joining Eddy Furniss, Blake Dean, Jason Williams, Todd Walker and Blair Barbier. With the win, LSU improves to 18-9 on the year and 5-3 in Southeastern Conference action while Mississippi State falls to 24-4 overall and 5-3 in the league. The rubber match between LSU and Mississippi State is slated for Saturday at 1 p.m. CT in Starkville. The game will be online only through the SEC Network+, which is accessible through Watch ESPN and the WatchESPN app. Fans can listen to the game on the LSU Sports Radio Network, including 98.1 FM in Baton Rouge. Live audio is also available at LSUsports.net/live. Cole Henry (2-1) fired five innings and allowed four runs on four hits, walked one and struck out a career-high nine batters to earn the win. Devin Fontenot was tremendous in relief once again for the Tigers. He threw 3.2 innings and allowed one run on three hits, walked three and struck out one. Todd Peterson entered for the final out of the game. JT Ginn (6-1) suffered his first career loss after allowing six runs—five earned—on nine hits, walked two and struck out nine in his five innings pitched. Riley Self, Jack Eagan, Spencer Price and Bryce Brock combined for the final four innings and gave up four runs—three earned—on four hits, walked one and struck out three. Duplantis slapped the second pitch of the game up the middle, and shortstop Josh Smith followed with a single through the right side to put runners on the corners. Smith stole second, and with two outs third baseman Chris Reid brought in Duplantis with his single to first base. An error by the second baseman allowed Smith to score and put Reid in scoring position for designated hitter Giovanni DiGiacomo, who singled through the left side to put the Tigers up 3-0 in the first inning. Mississippi State cut into LSU’s lead in the bottom of the fourth inning when center fielder Jake Mangum tripled to center field and then scored on a passed ball. Shortstop Jordan Westburg walked and first baseman Tanner Allen singled to the pitcher to put runners on first and second before right fielder Elijah MacNamee hit a two-RBI single to first base, cutting the Tigers’ lead to 3-2. In the top of the fifth with Smith on first after a leadoff walk, center fielder Zach Watson roped a double to left field, and left fielder Daniel Cabrera walked to load the bases. Reid then hit an infield single to second base to drive in two runs. With one out and runners on the corners, first baseman CJ Willis brought in Cabrera on a fielder’s choice to give LSU the 6-2 lead. With two outs and second baseman Gunner Halter on second after a one-out double in the bottom of the fifth, Westburg homered to center field to make it a two-run game, 6-4. In the top of the sixth inning, Duplantis singled with two outs and scored on a Smith double to left-center. Watson followed with an RBI double down the left field line to increase the LSU advantage to 8-4. 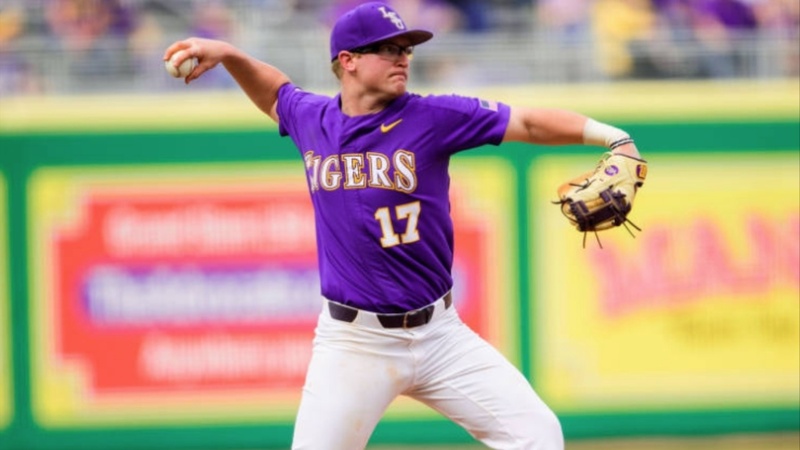 The Tigers tacked on a run in the top of the seventh when Reid reached on a fielding error and moved to second on an error by the first baseman. The senior third baseman advanced to third on a sacrifice bunt and scored on a sacrifice fly to center field by Willis to make it a 9-4 game in favor of the Tigers. In the top of the ninth inning with two outs, Reid was hit by a pitch and DiGiacomo walked to put runners on first and second for Willis, who slapped a single up the middle to drive in Reid and give LSU the 10-4 lead. Mississippi State did not go down quietly in the ninth inning. With two outs and runners on the corners, Westburg singled up the middle to drive in designated hitter Josh Hatcher, who reached earlier in the inning via walk, to make it a 10-5 game.